Figure 1: Western blot of lysates from HeLa cells (Lane 1), and c6/36 cells (Lane 2) probed with anti-CASP8 (upper panel) or with anti-Actin for loading control (lower panel). 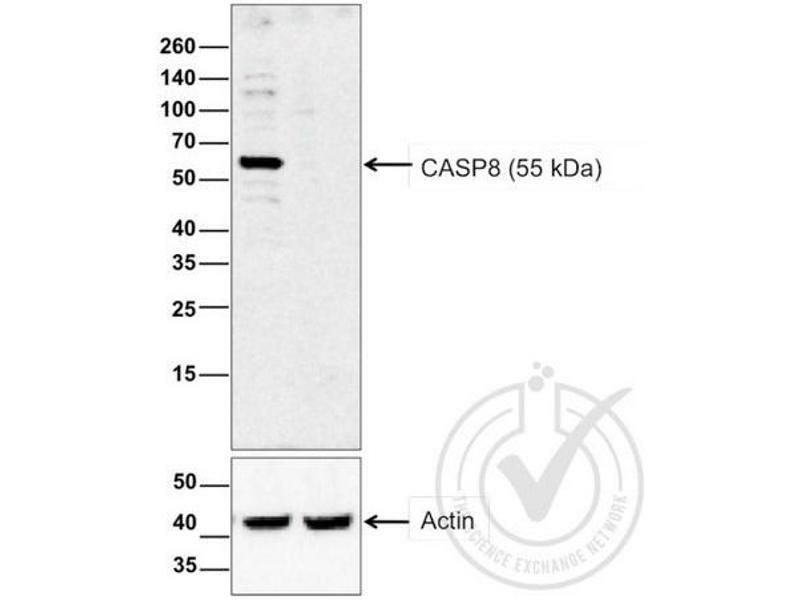 Read validation report #029759 for application Western Blotting. 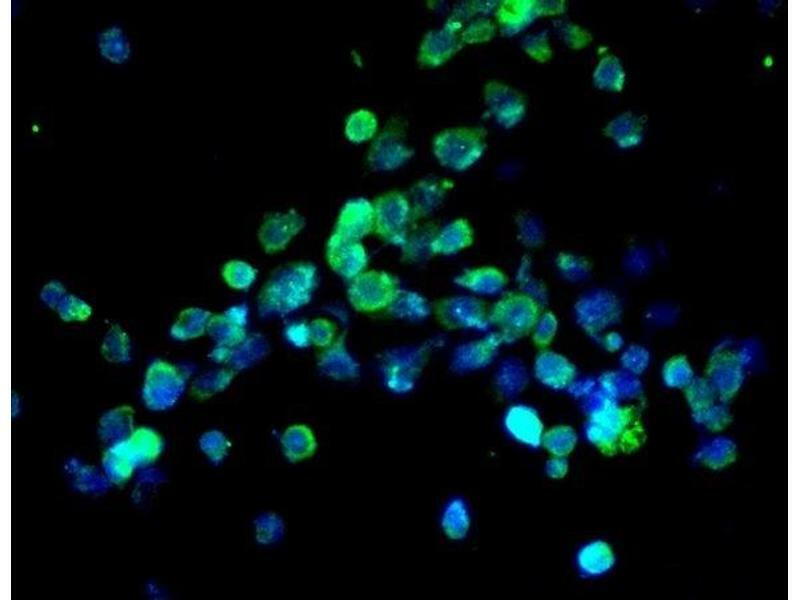 L1 mouse liver lysates L2 mouse spleen lysates probed with Anti Caspase 8 Polyclonal Antibody, Unconjugated (ABIN724205) at 1:200 overnight at 4 °C. Followed by conjugation to secondary antibody at 1:3000 for 90 min at 37 °C. Predicted band 12kD. Observed band size:48kD. 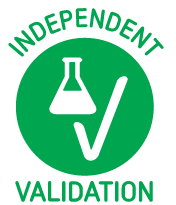 Image provided by the Independent Validation Program (badge number 29759). 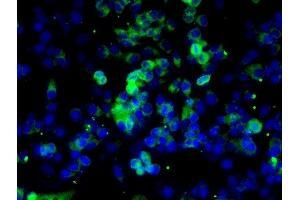 Lane 1: HeLa cell extract, Lane 2: c6/36 mosquito cell extract (non-reactivespecies) probed with Rabbit Anti-Caspase 8 Polyclonal Antibody, Unconjugated at 1:200 overnight at 4˚C. Followed by conjugation to secondary antibody at 1:20000 for 60 min at 26˚C. Image provided by One World Lab validation program. 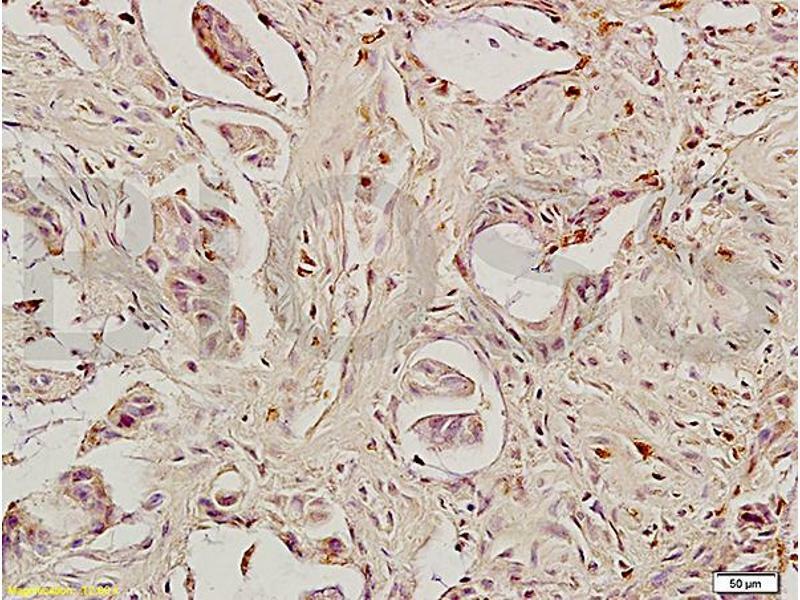 MCF-7 cells probed with Rabbit Anti-Caspase 8 Polyclonal Antibody at 1:50 for 60 minutes at room temperature followed by Goat Anti-Rabbit IgG (H+L) Alexa Fluor 488 Conjugated secondary antibody. Image provided by One World Lab validation program. 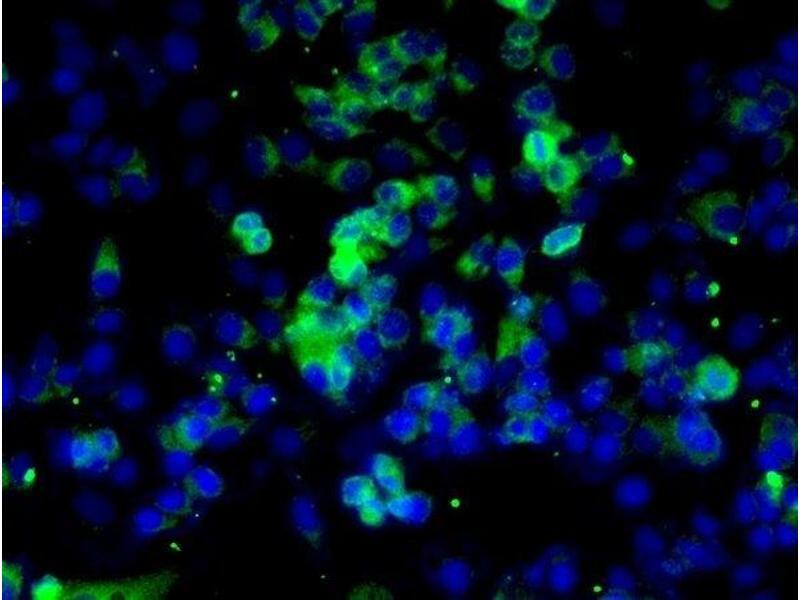 A431 cells probed with Rabbit Anti-Caspase 8 Polyclonal Antibody at 1:50 for 60 minutes at room temperature followed by Goat Anti-Rabbit IgG (H+L) Alexa Fluor 488 Conjugated secondary antibody. Notes A strong band was observed at the correct molecular weight in the positive control sample. No major bands were observed in the negative sample. 1. Total protein extracts were boiled in 1X SDS Sample Buffer containing 1% SDS and 1.25% β-mercaptoethanol at 95°C for 5 min prior to loading. 2. 20 μg of boiled extracts were loaded and resolved on 8-16% SDS-polyacrylamide gel. 3. The Thermo Scientific - Spectra Multicolor Broad Range (Cat # 26634) were used as molecular mass markers. 4. Proteins were then transferred onto PVDF membrane by wet transfer and protein transfer was confirmed with Ponceau-S staining. 5. The PVDF membrane was incubated with 25 mL of blocking buffer [Tris Buffered Saline, pH 7.4 plus 0.1% TW20 (TBST)] containing 5% (W/V) BSA at room temperature for 1 h.
6. The membrane was rinsed with TBST once. 7. 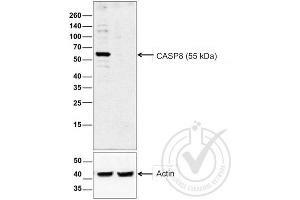 The membrane was immersed with the protein side up in the primary antibody solution (CASP8; 1:200) in TBST containing 5% (W/V) BSA and incubated for 16 h at 4°C. 8. The membrane was rinsed in TBST thrice for 5 min each. 9. The membrane was incubated in the HRP-conjugated secondary antibody solution (Goat anti-rabbit IgG-HRP; 1:20,000) in TBST containing 5% (W/V) BSA and incubated for 1 hour at room temperature (~26°C) with gentle agitation. 10. The membrane was rinsed thrice TBST thrice for 5 min each. 11. The membrane was rinsed in TBS twice for 30 s each. 12. Signals were detected with ECL-2 Substrate. The blot was scanned for 300 s.
13. The membrane was rinsed three times TBST. 14. Incubated in Acidic Glycine Stripping Buffer at room temperature with gentle agitation for 3 times, 10 min each. 15. The membrane was washed in TBST 2 times for 10 min each. 16. Repeated Steps 5-12 with the loading control antibody (anti-Actin; 1:6,000) and its matching secondary antibody (Goat anti-rabbit IgG-HRP; 1:20,000). Experimental Notes - Nothing to note. Most upstream protease of the activation cascade of caspases responsible for the TNFRSF6/FAS mediated and TNFRSF1A induced cell death. Binding to the adapter molecule FADD recruits it to either receptor. The resulting aggregate called death-inducing signaling complex (DISC) performs CASP8 proteolytic activation. The active dimeric enzyme is then liberated from the DISC and free to activate downstream apoptotic proteases. 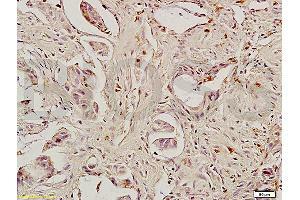 Proteolytic fragments of the N-terminal propeptide (termed CAP3, CAP5 and CAP6) are likely retained in the DISC. Cleaves and activates CASP3, CASP4, CASP6, CASP7, CASP9 and CASP1. May participate in the GZMB apoptotic pathways. Cleaves ADPRT. Hydrolyzes the small-molecule substrate, Ac-Asp-Glu-Val-Asp-|-AMC. 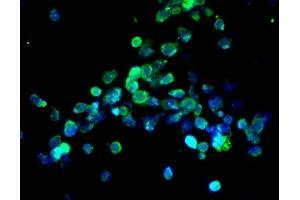 Likely target for the cowpox virus CRMA death inhibitory protein. Tulsulkar, Glueck, Hinds, Shah: "Ginkgo biloba Extract Prevents Female Mice from Ischemic Brain Damage and the Mechanism Is Independent of the HO1/Wnt Pathway." in: Translational stroke research, Vol. 7, Issue 2, pp. 120-31, 2016 (PubMed). Gao, Liu, Li, Wu, Peng, Jing: "Hispidulin induces mitochondrial apoptosis in acute myeloid leukemia cells by targeting extracellular matrix metalloproteinase inducer." in: American journal of translational research, Vol. 8, Issue 2, pp. 1115-32, 2016 (PubMed). 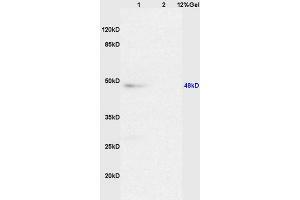 Method employed by authors: Western Blotting (WB) (Sample species: Human). Daverey, Agrawal: "Curcumin alleviates oxidative stress and mitochondrial dysfunction in astrocytes." in: Neuroscience, Vol. 333, pp. 92-103, 2016 (PubMed). 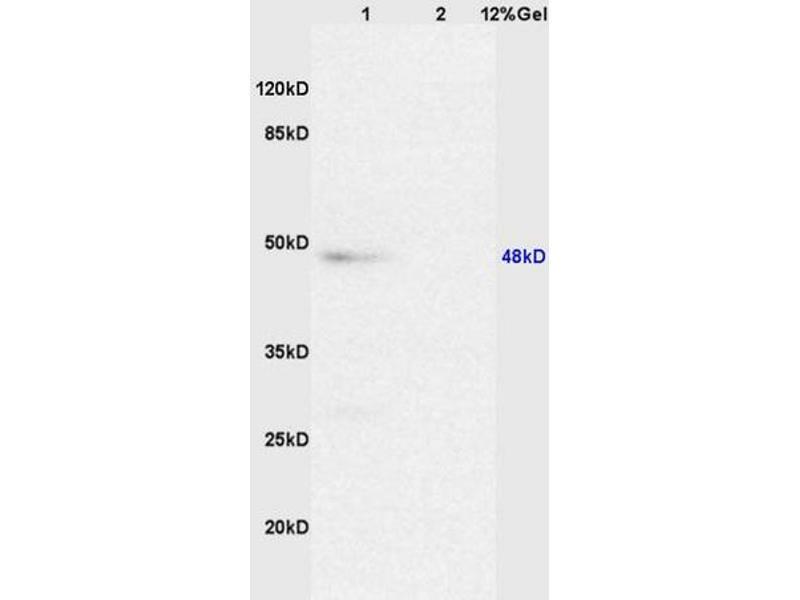 Method employed by authors: Western Blotting (WB) (Sample species: Human). Zhao, Zhang, Liu, Zhang, Hao, Li, Chen, Shen, Tang, Min, Meng, Wang, Yi, Zhang: "Hydrogen Sulfide and/or Ammonia Reduces Spermatozoa Motility through AMPK/AKT Related Pathways." in: Scientific reports, Vol. 6, pp. 37884, 2016 (PubMed). Method employed by authors: Western Blotting (WB), Western Blotting (WB) (Sample species: Pig (Porcine)). Fang, Zhang, Qi, Fan, Luo, Liu, Tan: "Evodiamine induces G2/M arrest and apoptosis via mitochondrial and endoplasmic reticulum pathways in H446 and H1688 human small-cell lung cancer cells." in: PLoS ONE, Vol. 9, Issue 12, pp. e115204, 2014 (PubMed). Method employed by authors: Western Blotting (WB) (Sample species: Human). Wu, Tang, Jiang, Li, Jiang, Liu: "PCSK9 siRNA inhibits HUVEC apoptosis induced by ox-LDL via Bcl/Bax-caspase9-caspase3 pathway." in: Molecular and cellular biochemistry, Vol. 359, Issue 1-2, pp. 347-58, 2011 (PubMed). Method employed by authors: Western Blotting (WB) (Sample species: Human). Jeng, Dyson: "Direct measurement of the aspartic acid 26 pKa for reduced Escherichia coli thioredoxin by 13C NMR." in: Biochemistry, Vol. 35, Issue 1, pp. 1-6, 1996 (PubMed).